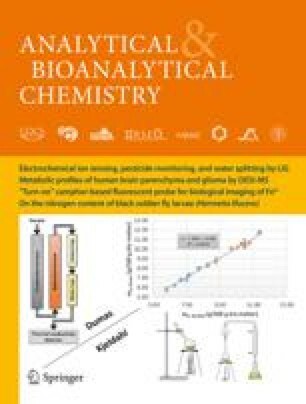 The use of Solid Phase Microextraction (SPME) for the qualitative and quantitative determination of Linear Alkylbenzenesulfonates (LAS) in waste water samples was investigated. A Carbowax/Templated Resin (CW/¶TPR) coated fiber was directly immersed into influent and effluent samples of a sewage treatment plant (STP). Extraction conditions such as time, pH, ion strength were investigated. The extracted LAS were desorbed with a solvent in a specially designed SPME-LC interface for analysis with HPLC-FLD and Electrospray Ionization Mass Spectrometry (ESI-MS). The combination of SPME with ESI-MS proved to be an alternative technique for the LAS determination in waste water. Linear ranges of the external calibration were found from 0.5–100 ng/mL, with detection limits of 0.5 ng/mL for each individual LAS homologue. The reproducibility of the method is 15% (relative standard deviation).